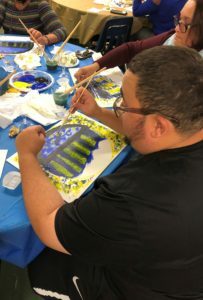 Parents Painting: Parent Association Kicks Off with Sip & Paint Night! One of our goals here at St. Joseph High School is to foster a sustainable, long-lasting relationship with the parents and family members of our students. 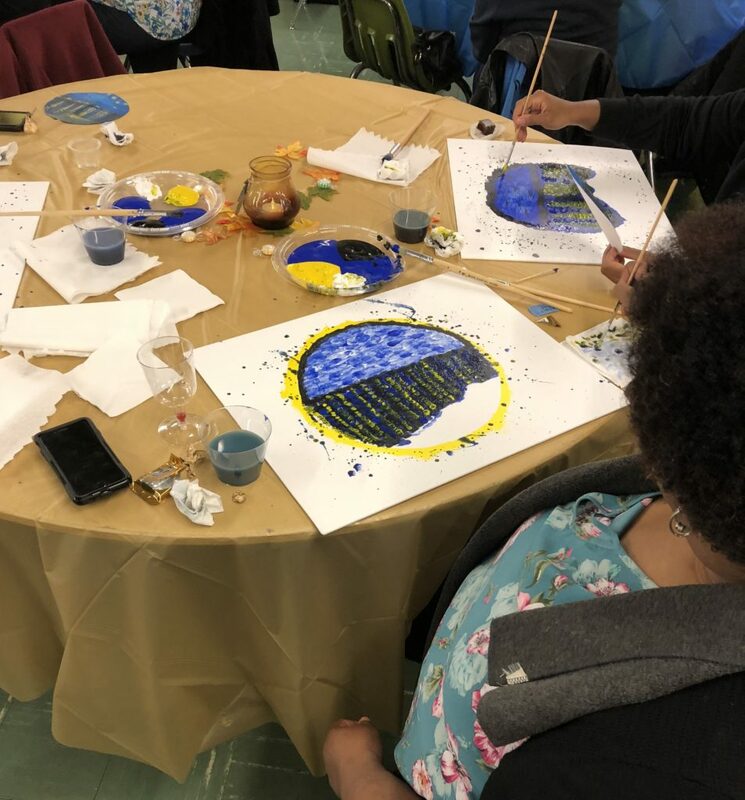 Last week, our new Parent Association planned and hosted their first social event of the year: a Sip & Paint night! One of our goals here at St. Joseph High School is to foster a sustainable, long-lasting relationship with the parents and family members of our students. We know that as the primary educators of their children, the parents of our students play the most important role in their daughters’ formative years. Without their support, attention, and care, nothing we do here at school would be possible. Parents have always been involved in the life of our school, from attending athletics events and performances, to cooking delicious food for school celebrations, to working one-on-one with teachers to facilitate student learning. But over time it has become clear that we could greatly benefit from a more consistent forum for parent engagement and socializing. With this in mind, Guidance Counselor Ms. Amina Worrell has launched a new Parent Association, a place where parents and guardians can get to know one another, and collaborate with St. Joseph’s mission to provide an excellent high school education. In addition to fun social events throughout the year, parents will be able to get involved with fundraising, provide feedback and suggestions to the school, network with other parents, help recruit promising new students and more. 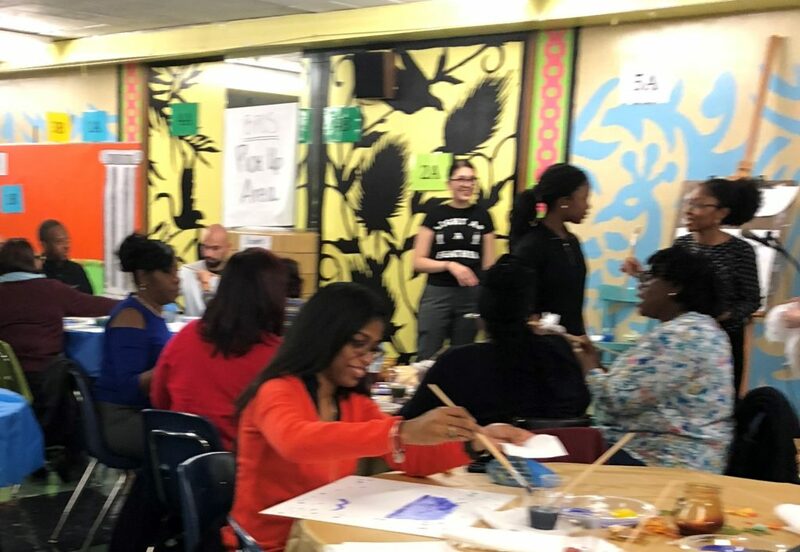 The Parent Association also planned and hosted their first social event of the year, with the assistance of several students and the Guidance Department: a Sip & Paint night! A painting lesson was provided by Sophomore Jasmine Pratt, with the assistance of Art Teacher Ms. Jenn Cacciola. The parents and other guests listened to Jazz and R&B as they sipped wine and painted. Students Jasmine Negron (Sophomore), Serena Pawa (Sophomore), Sharnay Anekie (Sophomore) and Adebola Adenodi (Junior) assisted with setup, clean up, serving refreshments and ensuring that guests were comfortable. Ms. Worrell was very pleased with the success of the event, “Throughout the evenening you could hear the guests singing and laughing. A request was made for a Karaoke night in future!” Towards the end of the night a raffle was held, with the prize going to a very special parent, the mother of our Athletic Director Coach Mike Toro. Are you interested in getting involved with the Parents Association or attending future events? Contact Ms. Amina Worrell by email at aworrell@sjhsbridge.org or call 718-624-3618.